From near to its source in Mongu in North Western Zambia to its mouth on the shores of Mozambique, I journeyed along the great Zambezi River, the fourth largest river in the world, observing and recording the interaction of the people and animals that live in and along its banks. For all life-forms, the river is more than their primary source of food and water – the river sustains their very existence and shapes their lives, physically and spiritually, a river of life. 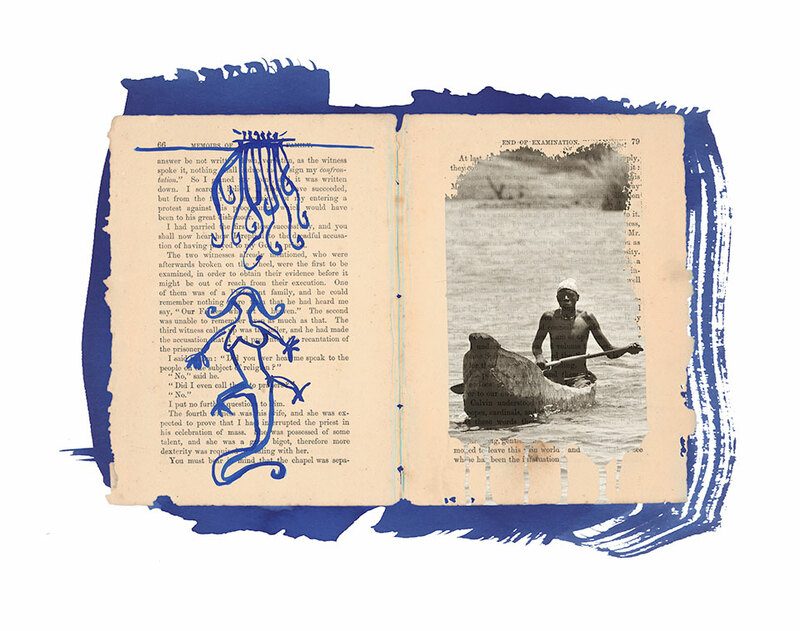 “Mami Wata Zambezi” or Mother Water Zambezi, the extraordinary mythological mermaid like creature whose duality is that of either a woman and a crocodile, or a crocodile and a snake gave rise to the theme for this collection. A mythical creature that through her magic can either give life with the annual floods, give gifts of coca-cola or tobacco or by sending one of her crocodiles or a malaria mosquito end a life. This relationship between the material or consumerist and the immaterial or spiritual world is what interests me. Mami Wata became my muse, as I created a visual expression of the journey into her world. I discovered the emotion, power and magic of the river, it’s people and animals. The 23 days on the Zambezi had a captivating duality for me – the water changed colour and speed, in stretches angry and muddy, along others, calm and mercurial – ever changing in its constant motion. The objective of my photographic work as a fine art pursuit is to connect myself with the world, in doing so I am creating an artifact that will connect the viewer to a subject of both cultural and historical interest. Presenting expressions of other landscapes and cultures, these artworks are a sketchbook of experiences that transport the viewer to another world. 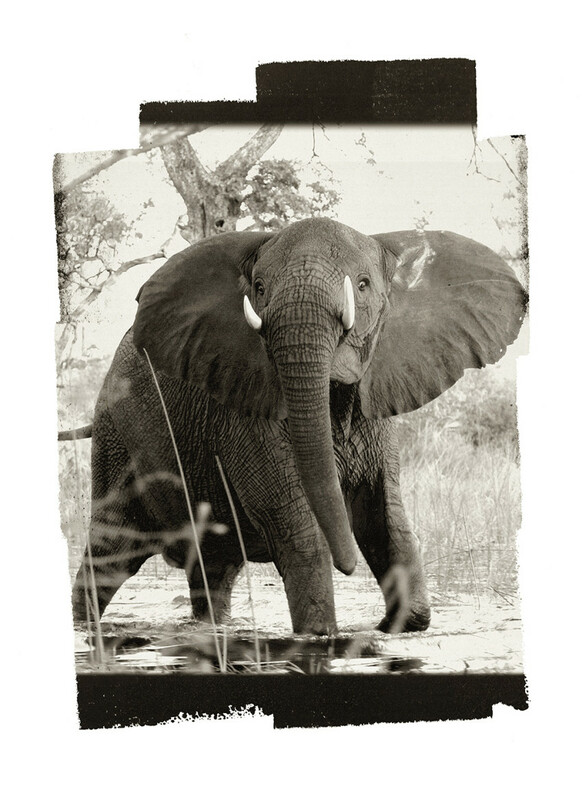 The images I photographed capture immediate moments on and around the Zambezi river. In order to show the duality of the experience which in some instances a single frame was not able to convey. I created artworks that consist of layers and multiple frames, the interaction between these layers and frames, conveyed this duality in motion. Our thought process is one that constantly interprets images to glean their meaning or intention. Working with layers, the viewer is enticed to explore the images and varied interpretations, the artwork keeps unraveling as the viewer experiences the detail hidden in the layering and the multiple images. 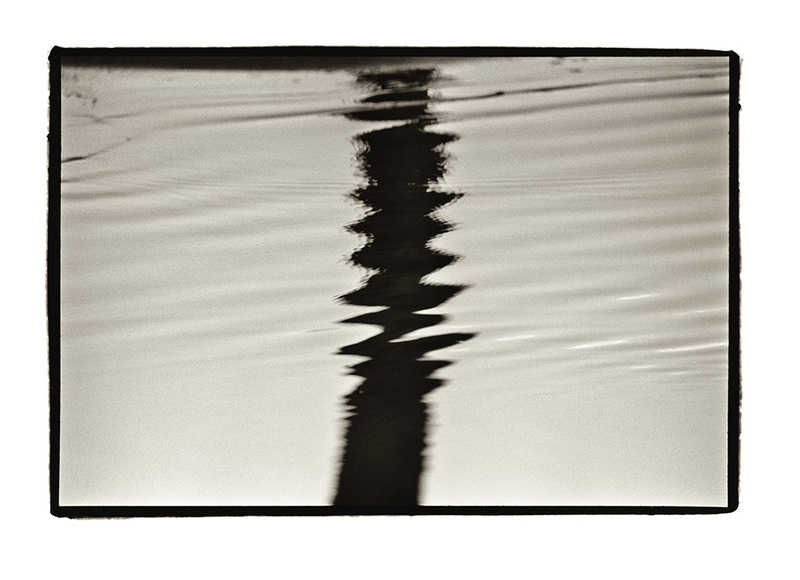 My images are intended to flow, to portray the motion of the river and engage the viewer. Using ink brush strokes and inspired by emulsion printing the photographs float on the liquid brush strokes, creating artworks that capture the mystery and the spirit of the river, people and animals. By showing the people and animals within the context of their environment the artworks capture the atmosphere of the river environment as well as the people and animals. The monotone images, best convey the beauty of the subjects as aesthetic elements and in some pieces juxtaposed with full colour artificial elements creating both a tension and a harmony. Inspired by the 17th century painters who used still lifes as metaphors for the transitory nature of human life these photographic works also provide quirky elements and interesting juxtapositioning of the natural with the artificial, reflecting the tensions and harmony that exist between man and his environment. 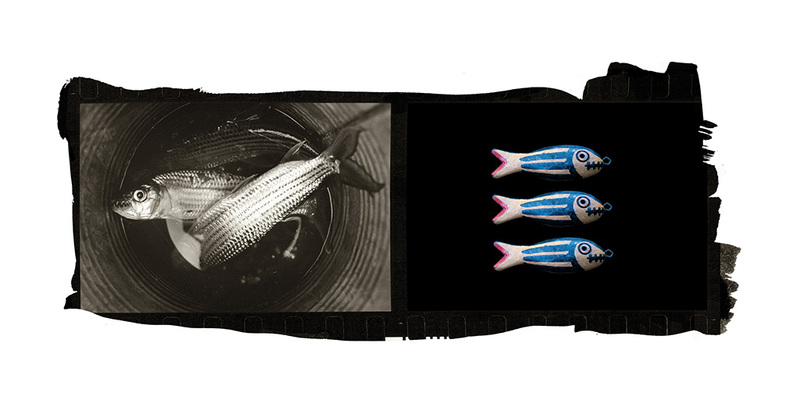 Photography’s power and pervasiveness is evident in all spheres of our daily life. I have attempted to distill and reconfigure, and bestow back upon an audience the energy of a captured moment in time, no longer merely a documentary approach to photography. 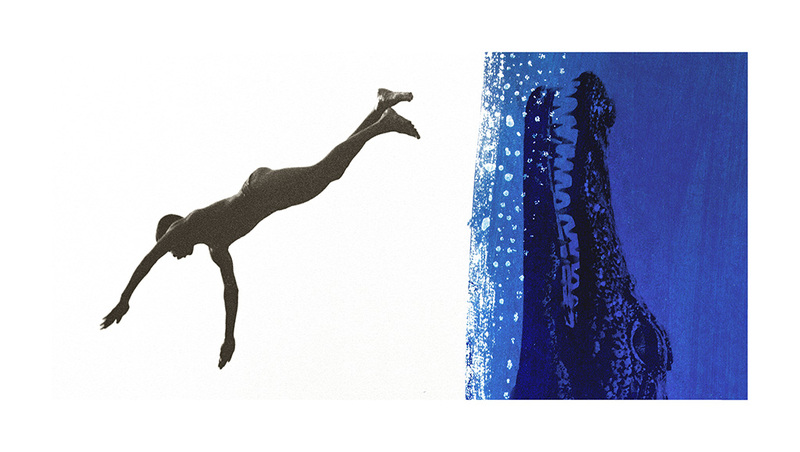 All prints are printed with archival pigment inks on 100% cotton rag paper. Each print is part of a numbered limited edition, signed and embossed in the front lower margin. This giclée print is a 100% archival, using both archival paper and inks. These limited edition prints are available in a range of 3 sizes. Title: AK 47 cartridge and a wooden fish light switch, Zambia, 03 April 2004. Size 2. Paper size 750 x 513 mm. cat. 401.2. Edition of 8, with 3 artists proofs. Size 3. Paper size 800 x 547 mm. cat. 401.3. Edition of 8, with 3 artists proofs. Title: April Fools Day, Zambezi River, Zimbabwe, 01-03 April 2004. Size 2. Paper size 1450 x 518 mm. cat. 402.2. Edition of 8, with 3 artists proofs. Size 3. Paper size 1500 x 536 mm. cat. 402.3. Edition of 8, with 3 artists proofs. Title: Binga crocodiles and a floating flip-flop, Zambezi River, 27 March 2004. Size 2. Paper size 1050 x 525 mm. cat. 403.2. Edition of 8, with 3 artists proofs. Size 3. Paper size 1100 x 550 mm. cat. 402.3. Edition of 8, with 3 artists proofs. 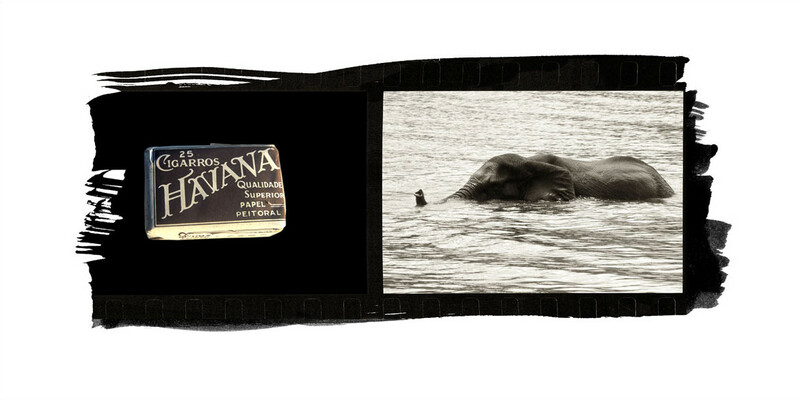 Title: Cigarros, Mocambique and a Kariba elephant, Zambezi River, 30 March 2004. Size 2. Paper size 1050 x 525 mm. cat. 404.2. Edition of 8, with 3 artists proofs. Size 3. Paper size 1100 x 550 mm. cat. 404.3. Edition of 8, with 3 artists proofs. Title: Crocodile boys, Senanga, Zambezi River, 21 March 2004. Size 2. Paper size 950 x 450 mm. cat. 405.2. Edition of 8, with 3 artists proofs. Size 3. Paper size 1000 x 474 mm. cat. 405.3. Edition of 8, with 3 artists proofs. Title: Crossing Kariba, Zimbabwe, 28 March 2004. Size 2. Paper size 1130 x 816 mm. cat. 406.2. Edition of 8, with 3 artists proofs. Size 3. Paper size 1180 x 852 mm. cat. 406.3. Edition of 8, with 3 artists proofs. Title: Elephant charge, Zambezi river, Zambia, 01 April 2004. Size 2. Paper size 700 x 900 mm. cat. 407.2. Edition of 8, with 3 artists proofs. Size 3. Paper size 778 x 1000 mm. cat. 407.3. Edition of 8, with 3 artists proofs. 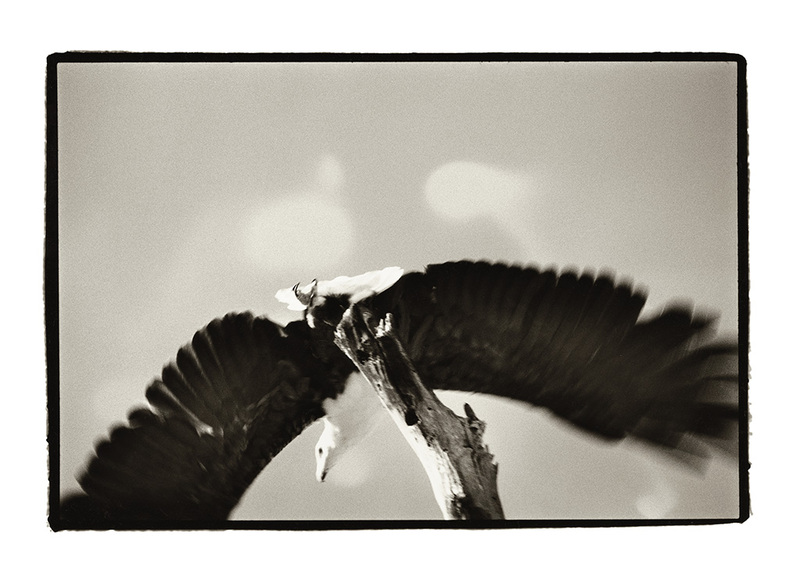 Title: Fish Eagle, Kariba, Zimbabwe, 28 March 2004. Size 2. Paper size 1130 x 816 mm. cat. 408.2. Edition of 8, with 3 artists proofs. Size 3. Paper size 1180 x 852 mm. cat. 408.3. Edition of 8, with 3 artists proofs. Title: Funny Money 1, Zambezi River, 5 April 2004. Size 2. Paper size 500 x 1125 mm. cat. 409.2. Edition of 8, with 3 artists proofs. Size 3. Paper size 550 x 1237 mm. cat. 409.3. Edition of 8, with 3 artists proofs. Title: Funny Money 2, Zambezi River, 5 April 2004. Size 2. Paper size 500 x 1125 mm. cat. 410.2. Edition of 8, with 3 artists proofs. Size 3. Paper size 550 x 1237 mm. cat. 410.3. Edition of 8, with 3 artists proofs. Title: Funny money 3, Zambezi River, 5 April 2004. Size 2. Paper size 500 x 1125 mm. cat. 411.2. Edition of 8, with 3 artists proofs. Size 3. Paper size 550 x 1237 mm. cat. 411.3. Edition of 8, with 3 artists proofs. Title: Gaurding Nyami Nyami, spirit of the Zambezi river, 23 March 2004. Size 2. Paper size 1070 x 788 mm. cat. 412.2. Edition of 8, with 3 artists proofs. Size 3. Paper size 1120 x 825 mm. cat. 412.3. Edition of 8, with 3 artists proofs. Title: Hippo charge, Zambezi River, Mana Pools, Zimbabwe, 01 April. Size 2. Paper size 1450 x 518 mm. cat. 413.2. Edition of 8, with 3 artists proofs. Size 3. Paper size 1500 x 536 mm. cat. 413.3. Edition of 8, with 3 artists proofs. Title: Lozi boys at Senanga, Zambia, 21 March 2004. Size 2. Paper size 1130 x 816 mm. cat. 414.2. Edition of 8, with 3 artists proofs. Size 3. Paper size 1180 x 852 mm. cat. 414.3. Edition of 8, with 3 artists proofs. 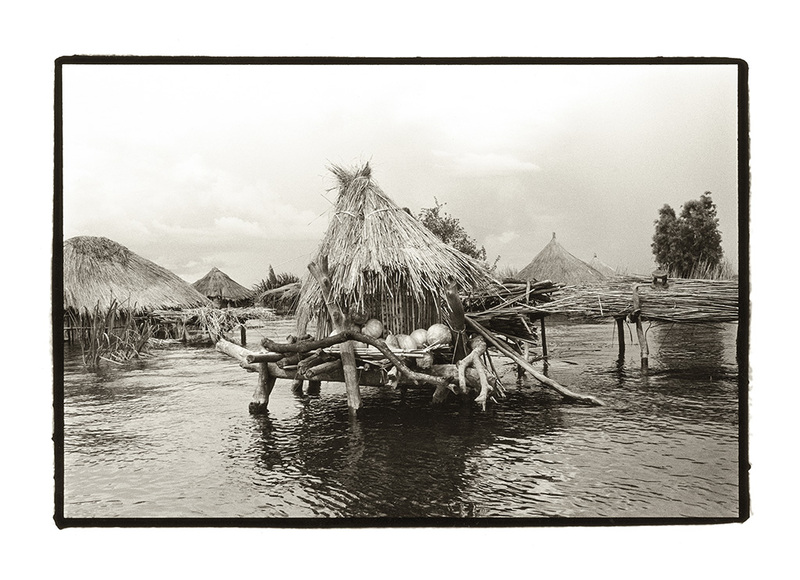 Title: Lozi village near Mongu on the flooded plains of barotseland, Zambia, 20 March 2004. Size 2. Paper size 1130 x 816 mm. cat. 415.2. Edition of 8, with 3 artists proofs. Size 3. Paper size 1180 x 852 mm. cat. 415.3. Edition of 8, with 3 artists proofs. 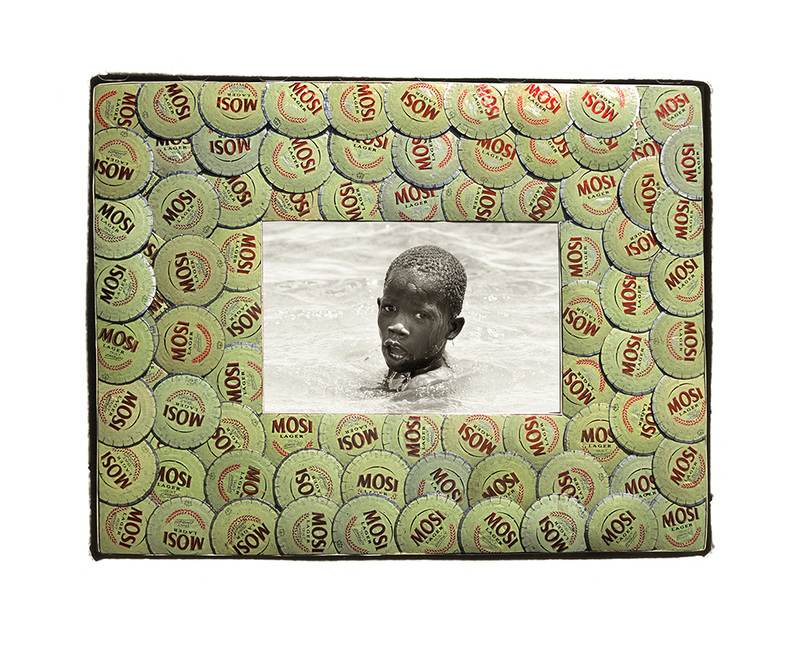 Title: Mosi Lager, Truly Zambian, Zambezi River, 24 march 2004. Size 2. Paper size 1100 x 900 mm. cat. 416.2. Edition of 8, with 3 artists proofs. Size 3. Paper size 1150 x 941 mm. cat. 416.3. 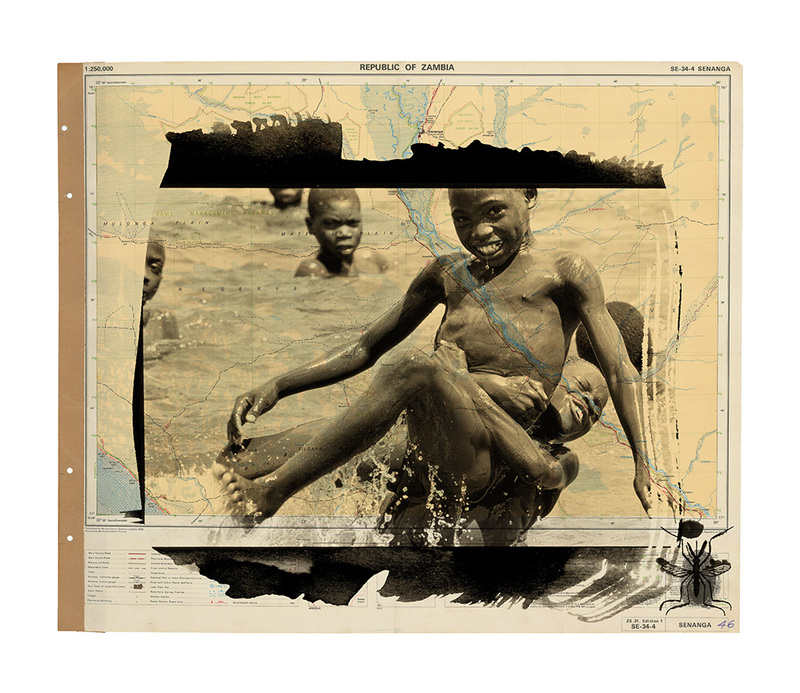 Edition of 8, with 3 artists proofs. 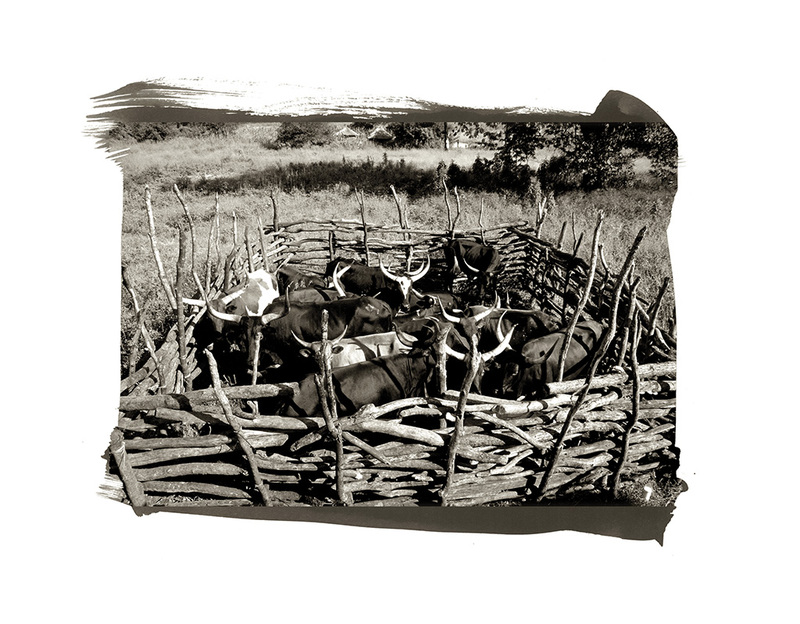 Title: Nguni cattle kraal and a bottle of milk, Sioma, Zambezi River, 22 March 2004. Size 2. Paper size 950 x 739 mm. cat. 417.2. Edition of 8, with 3 artists proofs. Size 3. Paper size 1000 x 778 mm. cat. 417.3. Edition of 8, with 3 artists proofs. 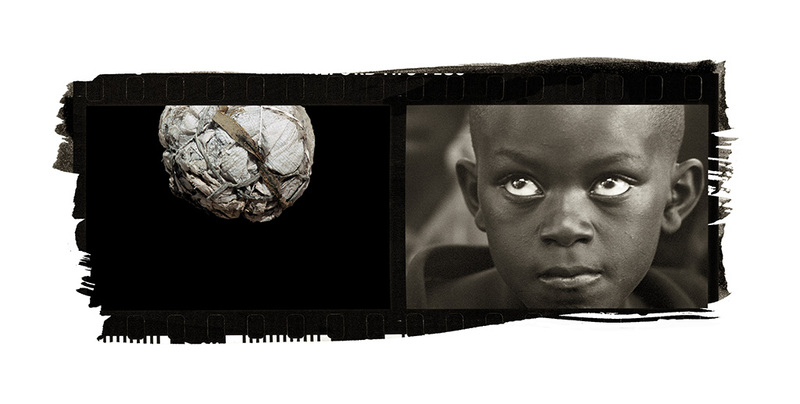 Title: Soccer player, Mocambique, Zambezi River, 08 April 2004. Size 2. Paper size 1050 x 525 mm. cat. 418.2. 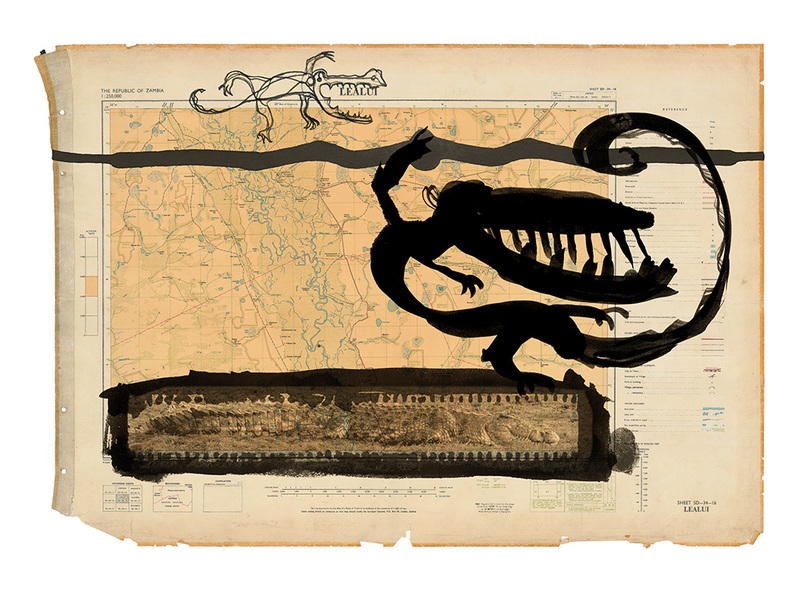 Edition of 8, with 3 artists proofs. Size 3. Paper size 1100 x 550 mm. cat. 418.3. Edition of 8, with 3 artists proofs. Title: Still life with 3 tigers, Zambezi River, Zimbabwe, 29 March 2004. Size 2. Paper size 1050 x 525 mm. cat. 419.2. Edition of 8, with 3 artists proofs. Size 3. Paper size 1100 x 550 mm. cat. 419.3. Edition of 8, with 3 artists proofs. Title: The Rivers end. "Delta do Rio Zambeze" 9 April 2004. Size 2. Paper size 900 x 634 mm. cat. 420.2. Edition of 8, with 3 artists proofs. Size 3. Paper size 1000 x 705 mm. cat. 420.3. Edition of 8, with 3 artists proofs. Title: The start, Mongu and a 5m crocodile, Zambia, 20 March 2004. Size 2. Paper size 1020 x 750 mm. cat. 421.2. Edition of 8, with 3 artists proofs. Size 32. Paper size 1020 x 750 mm. cat. 421.3. 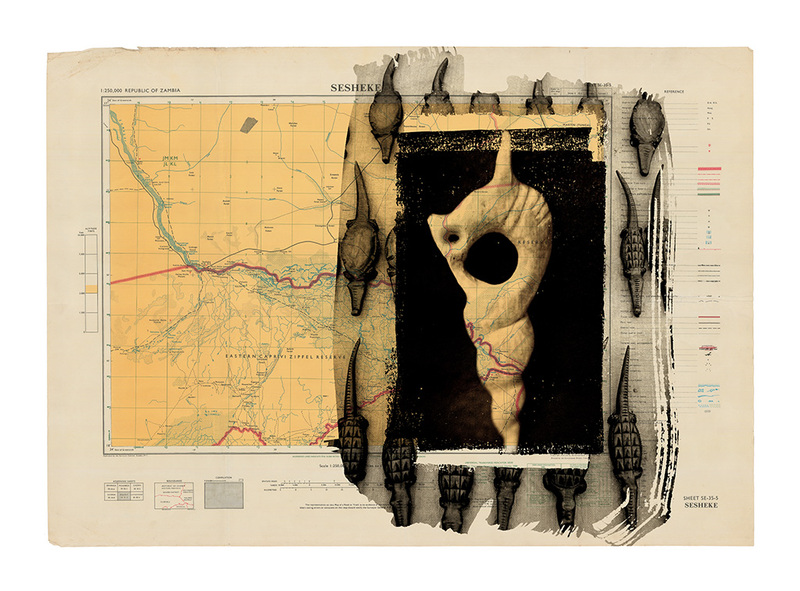 Edition of 8, with 3 artists proofs. 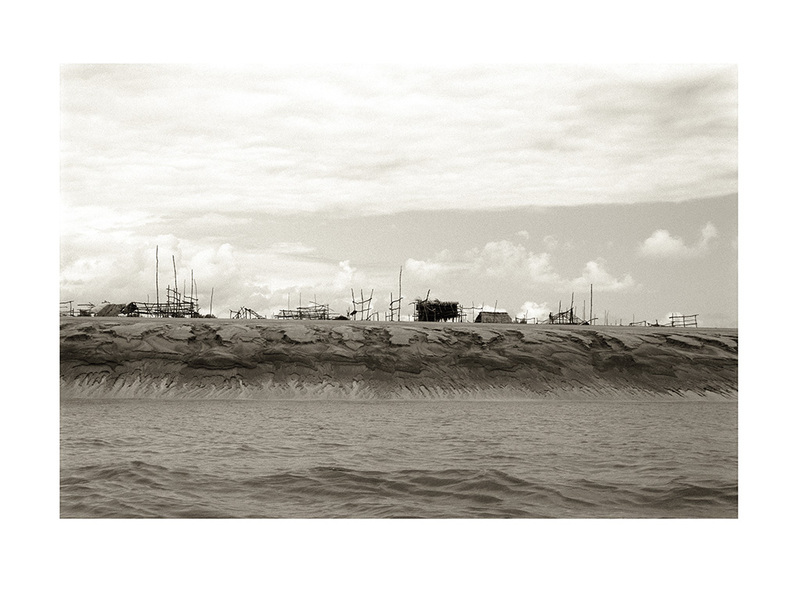 Title: The Zambezi River talks, 28 March 2004. Size 2. Paper size 1130 x 816 mm. cat. 422.2. Edition of 8, with 3 artists proofs. Size 3. Paper size 1180 x 852 mm. cat. 422.3. Edition of 8, with 3 artists proofs. Title: Two young male leopards play at the rivers edge, Chobe River, Botswana, 2003. Size 2. Paper size 1450 x 518 mm. cat. 423.2. Edition of 8, with 3 artists proofs. Size 3. Paper size 1500 x 536 mm. cat. 423.3. Edition of 8, with 3 artists proofs. 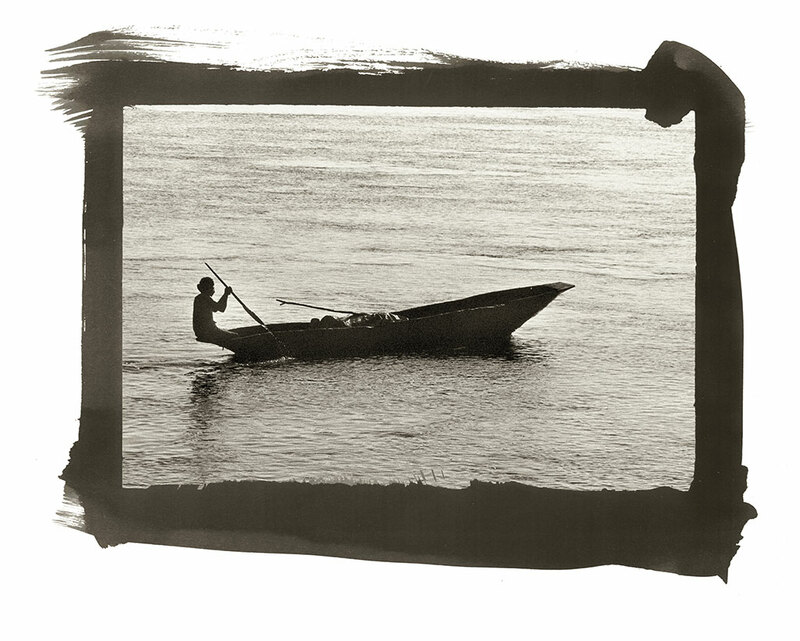 Title: Zambezi dive, Zambezi River delta, Mocambique, 9 April 2004. Size 2. Paper size 1450 x 518 mm. cat. 424.2. Edition of 8, with 3 artists proofs. Size 3. Paper size 1500 x 536 mm. cat. 424.3. Edition of 8, with 3 artists proofs. Title: Zambezi swallow dive, Zambezi River delta, Mocambique, 9 April 2004. Title: Mami Wata Zambezi*, *Mother Water Zambezi, Zambezi River, 9 April 2004. Size 2. Paper size 1650 x 928 mm. cat. 426.2. Edition of 8, with 3 artists proofs. Size 3. Paper size 1700 x 956 mm. cat. 426.3. Edition of 8, with 3 artists proofs. 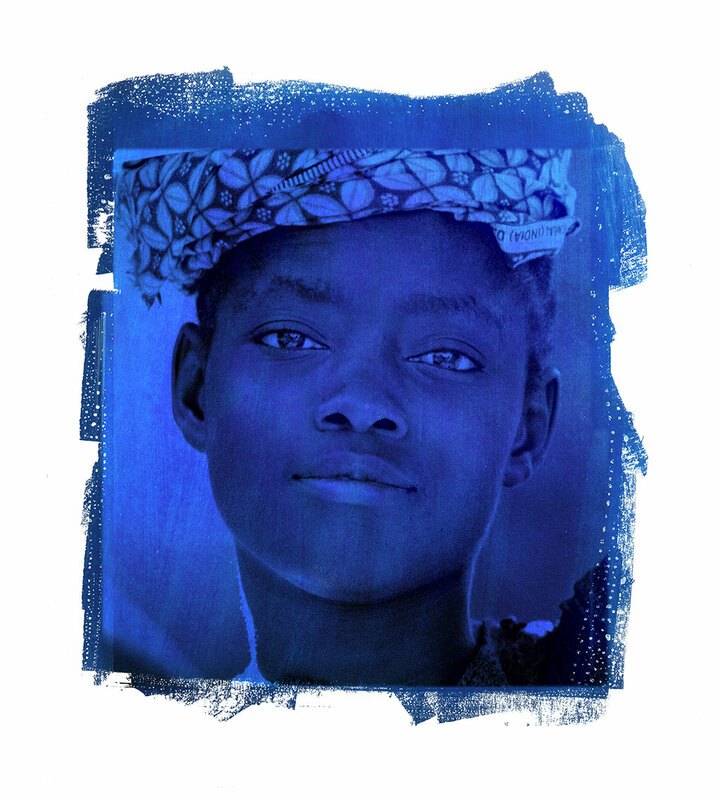 Title: Lozi lady, carrying water, Zambezi River, Senanga, Zambia, 21 March 2004. Size 2. Paper size 925 x 1027 mm. cat. 427.2. Edition of 8, with 3 artists proofs. Size 3. Paper size 950 x 1055 mm. cat. 427.3. Edition of 8, with 3 artists proofs. 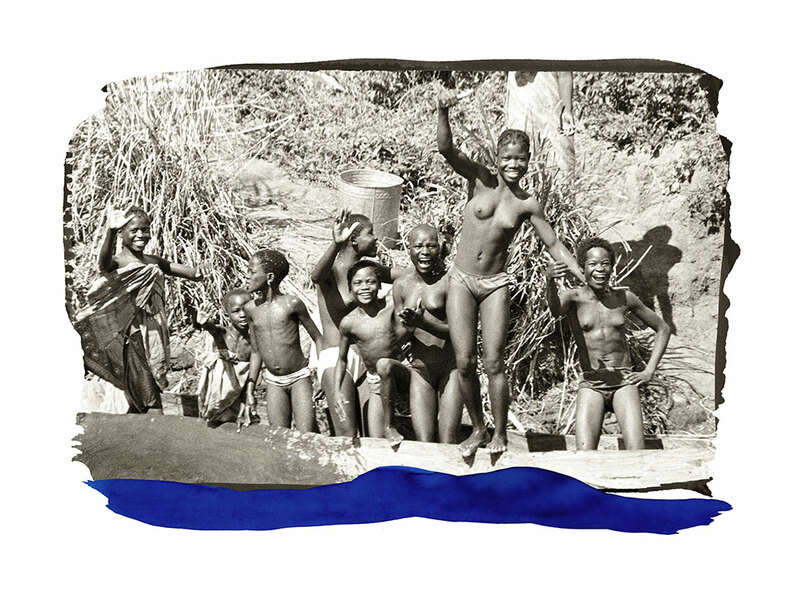 Title: Zambezi River maidens, at the rivers edge in a mokorro, Zambezi River, Marromeau, Mocambique, 8 April 2004. Size 2. Paper size 1020 x 773 mm. cat. 428.2. Edition of 8, with 3 artists proofs. Size 3. Paper size 1050 x 796 mm. cat. 428.3. Edition of 8, with 3 artists proofs. 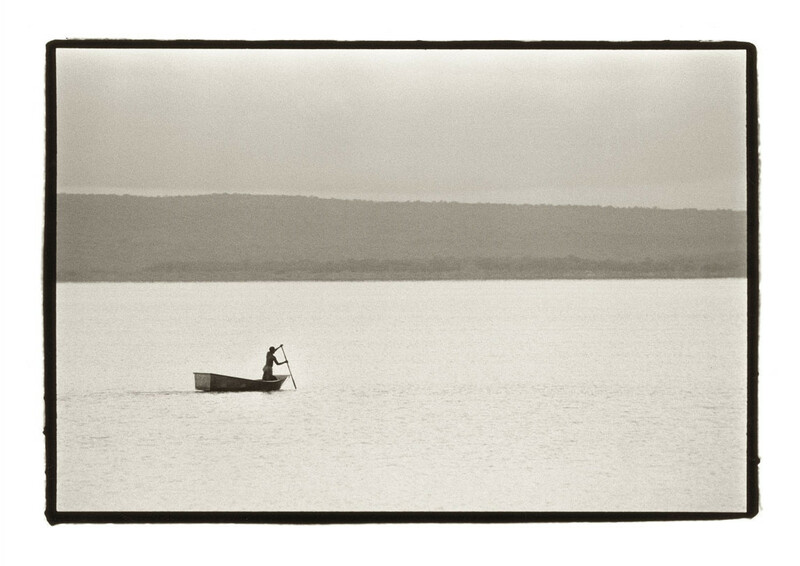 Title: Man in mokorro, Zambezi River, Tete, Mocambique, 7 April 2004. Size 2. Paper size 1020 x 818 mm. cat. 429.2. Edition of 8, with 3 artists proofs. Size 3. Paper size 1050 x 842 mm. cat. 429.3. Edition of 8, with 3 artists proofs. Title: The fisherman and Mami Wata discussing religion, Zambezi River, 24 March 2004. Size 2. Paper size 750 x 590 mm. cat. 430.2. Edition of 8, with 3 artists proofs. Size 3. Paper size 800 x 630 mm. cat. 430.3. 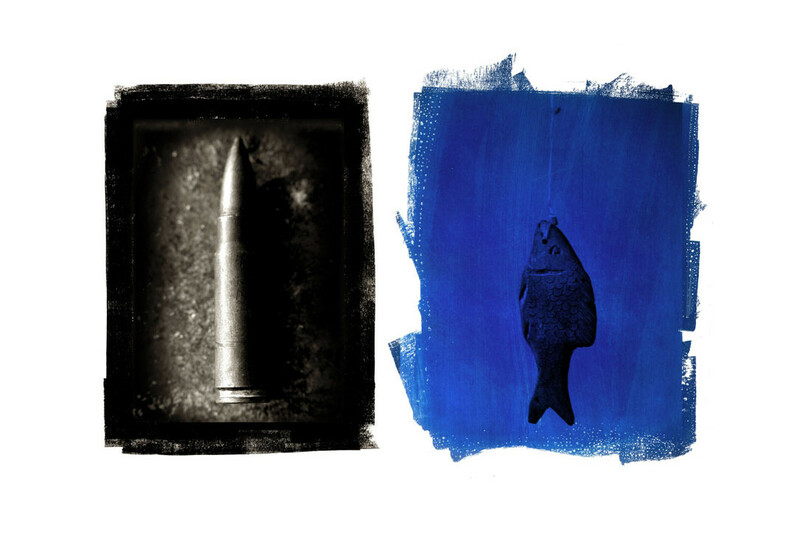 Edition of 8, with 3 artists proofs.